I give my students a lot of freedom in choosing a topic that is personally interesting to them. Many groups choose to do a traditional controlled experiment, but I always allow for more engineering-type projects as well. 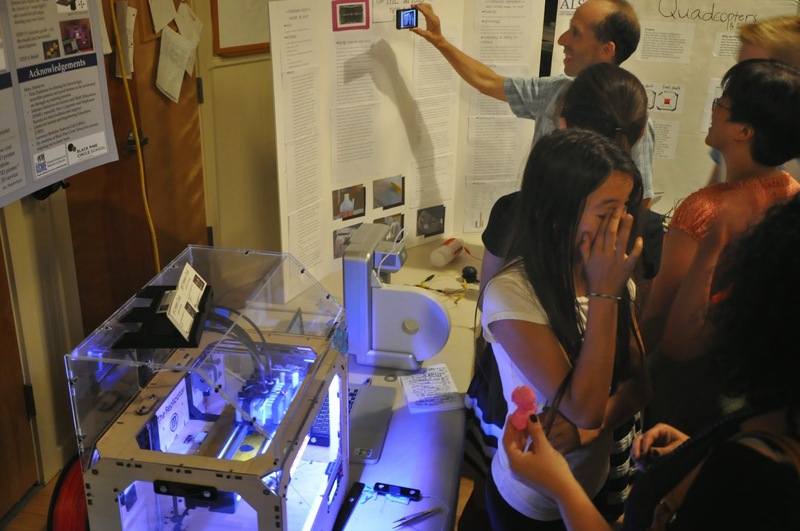 It was exciting to note that this year (the first year we officially incorporated "Maker Mondays" into the science curriculum) that there were more maker-inspired projects than in previous years. Abstract: We ran this experiment to see which parachute would work better. We made two parachutes: one out of a plastic bag, and one out of cardboard. We dropped them from 12.5 ft and timed how long it took for them to hit the ground. The plastic bag parachute average was 1.36 seconds and surprisingly lost to the cardboard parachute which had an average of 1.78 seconds before it hit the ground. We hope this will help future engineers build safer parachutes. 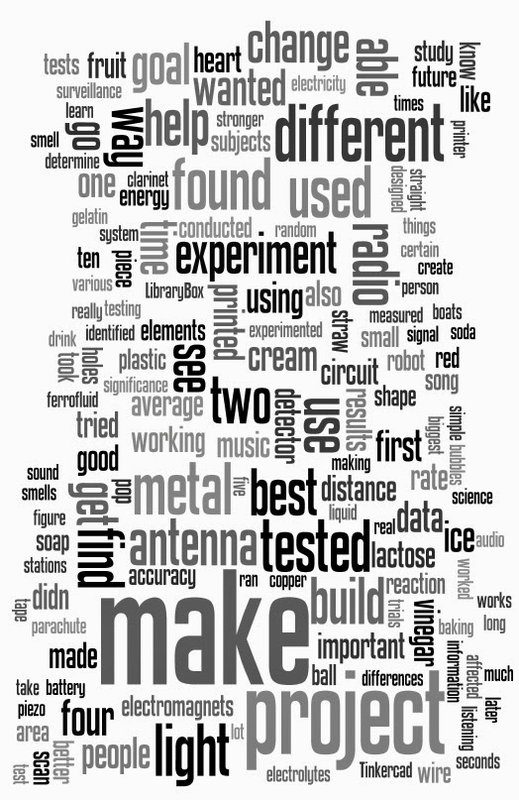 Abstract: We conducted a study to discover the antenna most practically shaped to receive millivolts and tried to build a working radio upon which to perform this test. Before working with the antennas, we had to assemble our radio. Then, we tried tuning into thirteen different stations and measured the millivolts each station received per antenna shape and recorded the results of the three best stations for each antenna. The results were unsurprising; the straight antenna had the best reception, followed by the spiral shaped antenna, and finally, the least functional antenna was the looped shape. Our radio was functional, and we determined that the straight antenna had the best and clearest range of stations. This project was significant because, although straight antennas were in use before, we confirmed that they are still the best shape to use commercially, saving future radio engineers time and energy designing new antenna shapes. Abstract: Our goal was to find out which of four drinks had the most electrolytes, by measuring volts. We did our project by creating a conductance sensor by using a multimeter, alligator clips, copper wire, and a 9V battery. We created a simple circuit so that when we put the two ends of our circuit into one drink, it would complete the circuit; we then recorded the voltage shown on the multimeter. We found out found that Powerade had the most electrolytes with 8.49V, then Odwalla Orange Juice with 8.4737V, then Powerbar Energy Drink with 8.4731V, and lastly Gatorade with 8.45V. The importance of this project is that it will help athletes know which drink is best and which drink they should use to replace electrolytes after sweating and working out. Abstract: Our goal was to build a shirt equipped with LEDs that light up up to the wearer’s pulse. We used the Pulse Sensor and the small Lilypad circuit board to achieve this goal. By programming the Lilypad and attaching the Pulse Sensor to it, we were able to make the LED read your pulse. Since we wanted to be able to display this in a cool and fashionable way, we decided to attach it to a shirt. In the future, this technology could be used for heart patients in need of constant monitoring. Abstract: We conducted a study to learn whether listening to music or other audio affects reading comprehension. We wrote four similar-length informational paragraphs about nonsensical things and questions to go with them. We took subjects to a quiet place and gave them the tests in four conditions: no music, a pop song, a newscast, and a classical piece. After testing 32 subjects, we graded for accuracy on both spelling and content. We also measured the amount of time each subject took for each test. We have decided to disregard our data on the no audio condition because of the fact that we did all of the no audio tests first, and the practice effect affected the data. The rest of our data showed that the subjects completed the worksheets fastest when listening to a pop song, and slowest when listening to a newscast. We believe this is because the pop song was musically the simplest and most predictable. We did not find any notable differences in the averages of the accuracy scores. The relatively small number of subjects and the wide range of scores may have obscured any differences that may have otherwise shown up in the data. 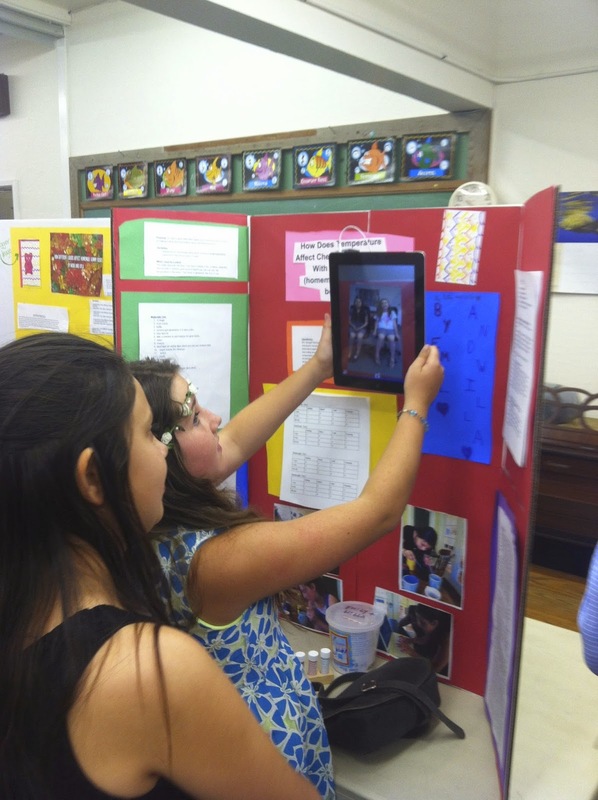 Another cool twist on this year's science fair was the addition of augmented reality (see recent post). 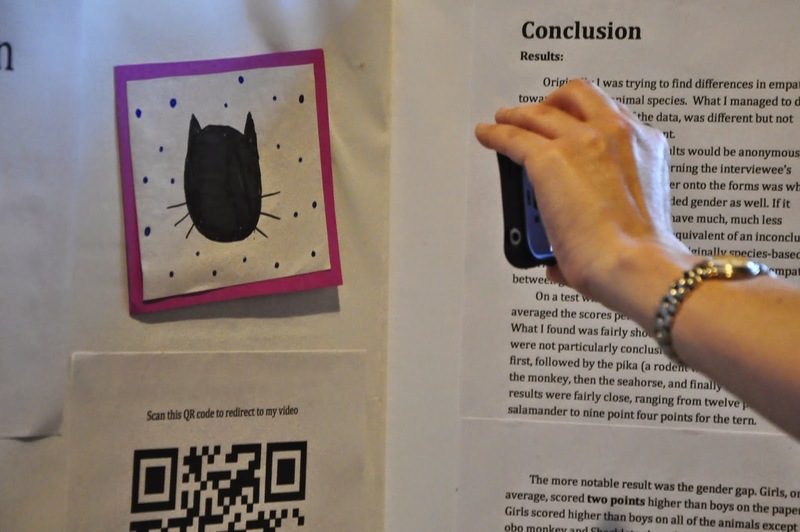 Using Aurasma, kids designed trigger images to add to their science fair boards. 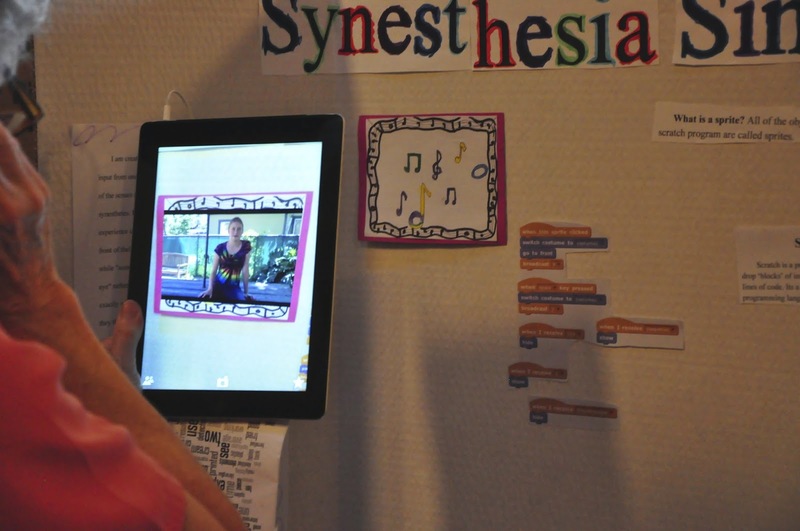 When these trigger images were viewed through a device using the Aurasma app, videos appeared! Of course, it is always best to hear from the kids themselves, but during the times they were not stationed at their board, family, friends and colleagues could hear about the project - in the voices of the kids themselves! Very cool. Plus, after the fair and long after the boards have been stripped and readied for next year, the trigger images live on in the hallway, available for anyone who would like to hear more about our science fair projects! Pre-science fair prep of kids' trigger images!